CARNDONAGH is getting ready for the return of its Annual Easter Parade. 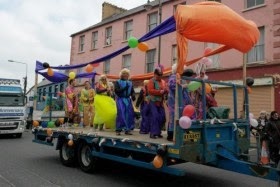 A local committee was recently formed to revive the old tradition in the North Inishowen market town to give people a boost of fun and colour in the recession. This family-friendly event will include a parade, fancy dress and a number of fun activities including Best Easter Bonnet competition. The event will take place on Easter Monday April 6th 2015 kicking off from Simpson’s car park. The parade will then proceed to the Diamond, down Bridge Street, onto Church Road and will return to the Diamond via Station Road and Malin Street, before ending at Simpson’s. There will be prizes for the Best Easter Bonnet, best fancy dress and best floats. Inishowen vintage cars and tractors will also be taking part and entries are invited from far and wide. The Muff Accordion Band and the Inishowen Carnival Group will attend while there will be live entertainment from a gig rig in the Diamond.